'Only 4 months into the year and I am already exhausted' I hear everyone cry! So far the Metal Tiger energy has been very demanding and tiring. 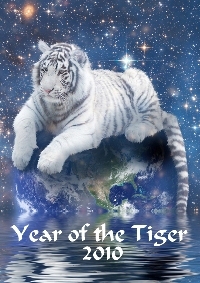 In Chinese Astrology, this year is symbolised by Yang Metal & Yang Wood (the Tiger). They are opposite elements and opposing forces, thus creating a kind of magnetic attraction that forms a dynamic combination. You may feel as though you are being pulled in many directions at once. Time management, rest, and the ability to say 'no' are very important skills to develop this year, otherwise you may notice you and alot of your friends feel burnt out, or get sick more often in 2010. Accidents caused by fatigue and rushing may be more prevalent this year so slow down and look both ways. Note: August is the clash month (challenging, demanding, unsettling) for this Tiger year. I advise you not to schedule anything major from August 6 until September 8, 2010. As I mentioned in my last newsletter, the Tiger is a 'travel star' which can make people very restless. People will feel the urge to travel, change jobs, move house, renovate and start or end relationships. 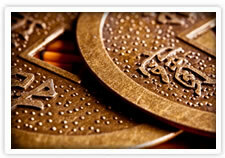 The elements of Yang Metal & Yang Wood are symbolised by metal chopping wood. It is necessary to trim a plant to help its growth, and this year anything that is hindering your soul's progress or higher purpose will be removed. I have already seen quite a few examples of relationships which have been in trouble for many few years, yet when the Metal Tiger year began the relationship finally ended. This also applies to work you are no longer happy doing. If you don't make the decision to go, someone else will make the decision for you. Regular space clearing of your home and business is particularly important during this demanding year! Energetic layers of negative emotions such as sadness, stress, confusion, depression, fear and anger can build up in our homes creating blockages and disharmony in our lives. These layers are left by us, our loved ones, our friends and colleagues. Because of our busy lives and many other preoccupations and distractions, we simply do not see or feel the thick soup of energy we wade through every day. We forget that the building we live in is not a solid form, nor is the lounge we sit on, or the bed we sleep in. The entire universe and everything in it is in a constant state of vibration, each object and person vibrating at its own, unique frequency. Open all windows .. move around your home or office in a clockwise direction... using your sound tool or incense .... ask your spirit guides to transform all negative energies ... into harmonious, peaceful and positive energies. You may be aware of the current research advising many popular brands of plastic baby bottles leach Bisphenol A, a hormone-disrupting chemical. According to The Group for Safe Markets "Bisphenol A is a developmental, neural, and reproductive toxicant that mimics estrogen and can interfere with healthy growth and body function" (p.4). If you are interested in reading more about the research and health effects of Bisphenol A on your baby, read Baby's Toxic Bottle. We are happy to advise we now sell non toxic and hormone free glass baby bottles in our Better Health Shop. Made in Australia by Etheco, these glass baby bottles are made of laboratory grade Tuxan tough glass that does not leach Phthlates or Bisphenol A. They can withstand temperatures of up to 600 degrees and can be boiled, microwaved and sterilised with no concerns of harmful chemicals leaching into your baby's delicate and precious body. The planet Mercury will go retrograde for 3 weeks causing hiccups with all forms of communication, including planes, trains and automobiles. Emails, text & phone messages, letters and contracts can disappear, leaving you wondering what is going on, and why people have not got back to you. Anything mailed can also go astray. Computers can slow down at this time due to system errors, or slow down due to internet provider problems. You may experience problems with your internet or phone connection. Plane, train, bus, and tram schedules can go out the window. Your car may start running a bit rough during Mercury Retrograde. In peak hour, there may be an increase in car breakdowns, and traffic lights can malfunction causing lengthy delays. Back up your computer before 18th April. Finalise all contracts, projects and forms of communication before the 18th. It is not a good time to begin new projects. It's best to wait till after 12th May when Mercury will go Direct (move forward again). If you begin a project while Mercury is Retrograde, expect the project to be frustratingly slow and problematic. If you are in the middle of negotiations, allow for delays and misunderstandings. Keep a copy of everything which is sent, in case it has to be sent again. Don't schedule tight deadlines .. factor in delays! Before going on holidays or business travel, double check all documents and schedules before you leave. Allow plenty of time to get to the airport. Allow plenty of time to transfer between flights. Most important ... relax ~ breathe ~ and go with the flow! Due to many requests from people throughout Australia, I am now offering remote feng shui consultations. With the help of Google Maps and your local Street Directory, it is possible to obtain an accurate compass reading of the facing direction of your property. You will need to email or fax the year the building was built, the floor plans of your building, and a photocopy of your street directory page. 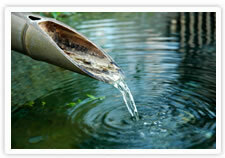 For more information, go to Remote Feng Shui Home Consultations or Remote Feng Shui Business Consultations. I hope you enjoyed my Newsletter! If you have any questions, please do not hesitate to contact Carol. 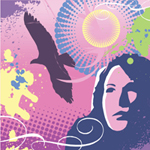 For daily feng shui tips and inspiration, follow me on Twitter. I have also set up Feng Shui Forum on Facebook to answer general questions you or your friends may have about all things esoteric. 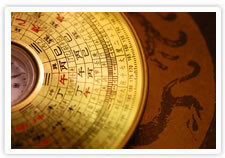 Are you unsure what to expect from a qualified feng shui consultant during a feng shui consultation? 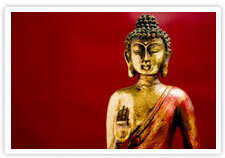 Read my handy information page feng shui consultant. May the Spirit of Prosperity bring you blessings and bliss!